"I say that it is a narrow policy to suppose that this country or that is to be marked out as the eternal ally or the perpetual enemy of England. We have no eternal allies, and we have no perpetual enemies. Our interests are eternal and perpetual, and those interests it is our duty to follow." Of the 194 independent states currently in existence you would be hard pressed to find many that have more potential than the United Kingdom. As I explained here and here the British state has a raft of in-built advantages, from its globally engaged and powerful economy to the range of useful overseas territories, modern armed forces and an impressive diplomatic footprint. And yet, since the end of the Second World War, Britain has lurched from crisis to crisis with events and political short termism dictating national strategy. Since the 1956 Suez Crisis the relationship with the United States, never one of equals, has steadily come to replace British strategy abroad. At home the relationship with the European Union and it's predecessors has also curtailed national strategic decision making. For the best part of a century an uneasy hodgepodge of US and European grand strategy has effectively been British grand strategy. This has led to the steady atrophying of a unique political and military culture, that was decidedly un-American and un-European, with no real replacement. While much world-class strategic thought still goes on in the UK it is largely confined to Academic spheres, lacking integration with mainstream politics and public consciousness. What must be recognised to move forwards is that our current approach has been broadly unsuccessful and that what's needed is a distinct and British grand strategy, designed to use the UK's strengths to secure and advance its national interests in the long term. To begin to formulate a grand strategy first a question must be asked and answered: "what will Britain's vital national interests in the coming century, and beyond, be?". I would argue some are obvious and eternal; the enduring territorial integrity of the British isles, the continued existence of the United Kingdom as a single political entity, economic prosperity, stability, the protection of British citizens wherever they may be and the sustainment of the Western liberal order. Simple, direct and broad in scope these are what I conceive Britain's long-term interests to be. To define UK interests too narrowly and specifically would ensure that the resulting analysis would eventually become dated and increasingly irrelevant. It also avoids falling into the trap of confusing values with interests. Although the sustainment of the Western liberal order is a vital national interest, it's expansion is not. Events in the last decade and a half have shown that trying to forcefully expand the borders of the Western order is usually futile and has unintended consequences. That said, states willingly wishing to join that club should be admitted with open arms; as Eastern Europe was after the collapse of Soviet Communism. For these reasons the interests that drive grand strategy must be broadly defined and enduring. If the ends sought are to be broadly defined and eternal, then the ways used to achieve them; the grand strategy, must take an equally broad approach to the UK's geo-strategic challenges. In contrast with simple political or military strategy, which draw upon distinct resources to achieve specific goals in the short to medium term, grand strategy aims to combine all aspects of national power and influence in pursuit of its aims. When applying narrow forms of power, be they military, diplomatic, economic or otherwise, Britain often fails to live up to its potential. The United Kingdom does not have the most powerful global economy, the military might of a vast continental state, or the raw influence to be the essential diplomatic power broker. However, when taken together it's easy to see that Britain has nearly unrivaled national power across the whole spectrum. The British armed forces may not be the most powerful, but they have a range of impressive capabilities and can still "go to the crisis" with decisive force if needed. The UK wields impressive influence through it's global diplomatic presence, with seats in countless international organisations; not least of which is permanent membership of the UN Security Council. Although it's true that Britain can't compete with the vast resources of China and the United States for economic power, only a fool would call the UK economically weak. While the 2008 financial crisis hit key sectors of the economy hard Britain is currently amongst the fastest growing economies in Europe, a dynamic medium-sized economy with a strong tradition of the rule of law and the ability to efficiently mobilise its resources. If there is one aspect of national power in which Britain excels, yet continues to underutilise, it is cultural. 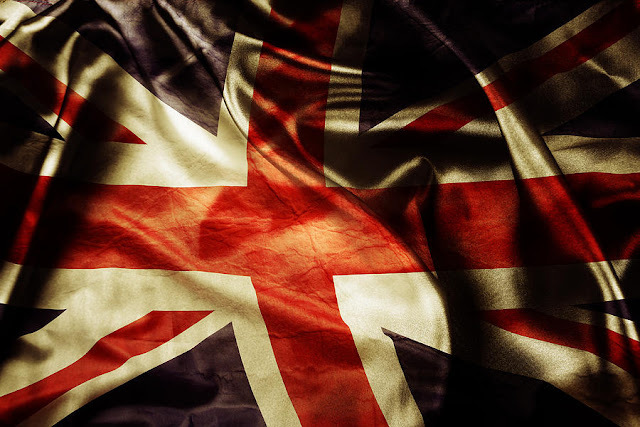 While feelings on Britain's imperial period are decidedly mixed, the overriding legacies of Empire: the Anglosphere, the Commonwealth, English as the global language of commerce, the export of British common law and institutions as well as the "Westminster system" of government tend to be positive ones that (if used correctly) will continue to enhance UK power. If Britain wishes to protect and advance its national interests it must be done by wielding comprehensive, rather than narrow and specific, national power. and cultural power effectively in pursuit of its interests. Before beginning to look at an overarching national strategy it's necessary to examine what has prevented the UK from doing so over the last half century or so. The outcome of the 1956 Suez war, the "last gasp of the imperial lion", effectively shackled much of British foreign policy to that of the United States. Whether the Americans intended for that to be the outcome is up for debate, but the practical long-term consequence was an ever closer foreign policy union between the two great Anglosphere nations; a union that has increasingly become dominated by the senior partner. While the "Special Relationship" has not been one of true equals for a very long time, on it's own it doesn't explain the British dependence on America's foreign policy leadership. For that we must look at to the period of decolonisation after the Second World War and the growth of an unhelpful Eurocentric view of the world. Although the decision for Britain to withdraw from its vast Empire after 1945 was certainly, in hindsight, the correct one; the imperial possessions that were being abandoned were too often confused with structures established to protect the UK's overseas interests. 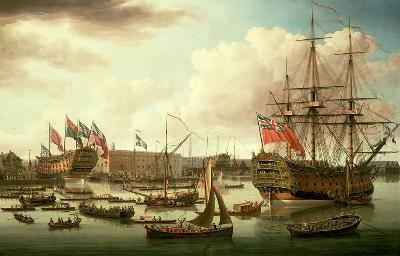 It is easy to forget that when Britain first acquired an Empire, its territories existed to provide a string of naval bases that supported maritime forces capable of defending and advancing British interests. The vast land empire, which emerged later as a product of the Industrial Revolution, overlaid the original structure and obscured its purpose. Bases, and the commitments they underpinned, in the Mediterranean, Indian Ocean, Persian Gulf and South China Sea were abandoned in the decolonisation drive. During this process the expectation was often that the United States would become Britain's proxy in the abandoned regions, who would defend British national interests at little to no cost to the UK. While the Americans certainly did enter these regions as the guarantor of stability, they came with their own economic and diplomatic agendas that often didn't match Britain's. It is too easy to forget that while the US is a diplomatic, military and cultural ally of the first order; it remains an economic competitor and undeniably self-interested in that regard. The second factor that has contributed to the atrophy of British grand strategic thought is the increasingly Eurocentric approach to foreign policy, instigated by the Cold War and exacerbated by the period of relative decline in the late 1960s and through the 1970s. At that time there was a belief, strongly held by some, that in the future the United Kingdom could redefine itself as a mid-sized European power; rather than as a great power situated in Europe but with interests and concerns that spread far beyond the continent. This view contributed to the UK's steady collapse down to a continental defence posture, designed for the Cold War confrontation in Europe, that was ill-suited to the defence and advancement of it's interests elsewhere. A concerted effort was also made to abandon much of Britain's presence outside Europe throughout that period, although the retreat from 'East of Suez' was the most prominent, Mediterranean and South Atlantic commitments were also drawn down. All of this, combined with a degree of fatalism amongst decision makers, often meant that the draw down from what were perceived as imperial commitments was pushed further and faster than it should have been. To some extent Britain's improved economic condition (and the boost given to national confidence by victory in the Falklands and the Gulf) curbed the worst of the declinist tendency amongst policymakers for a time. Now, however, after a grueling decade of conflict in Iraq and Afghanistan we are seeing a return to timid passivity in the face of some of the gravest crises since the end of the Cold War a quarter century ago. Such behavior is placing greater burdens on an already overburdened United States, still a vital and potent ally, as well as failing to support British national interests. There is also the uncomfortable fact that the United Kingdom is often led, handled and judged as if it were a smaller and less potent copy of the United States. An apparent ignorance of what must be done to maximise Britain's international power is particularly concerning. Too often have leaders missed the basic truth that a country with the will to be engaged and active on the international stage will always "punch above its weight", whereas those too timid to do so will usually remain on the sidelines. In the event of a crisis there is often much to lose and little to be gained by not being involved, or at least possessing the ability to become involved at short-notice. UK apart from other countries over the centuries. The lesson of the last sixty years is clear: while allies are often essential to the success of British engagement abroad they are a very poor substitute for sovereign capabilities and action. Therefore, before a grand strategy tailored to Britain's situation can be developed, there must be some degree of separation from the foreign policy goals of the United States and from the European continent. While policymakers will likely still find that UK and US interests often align closely, making co-operation highly desirable, a more independent and mercenary approach should be taken when interests conflict. As for the affairs of the European continent, they stand as more of an impediment to a global strategy for Britain than anything else. While stability in Europe is an important, likely essential, component for a successful global Britain, protracted continental commitments have almost always proved an expensive distraction. Only when it's vital national interests are at stake should the UK consider entering into binding continental commitments. "Business as usual" on the continent would be the exercise of influence through diplomatic and economic means, backed up by UK-based armed forces that could be deployed in the event of a serious crisis. On the subject of Europe, the gravest threat is likely to remain an embittered, revanchist Russia. While Putin's conservative clique remain in power it seems likely that tensions will be high, as liberal Western values collide with Russia's deeply conservative world view on the fringes of Eastern Europe. The challenge for Britain is that Eastern Europe is fundamentally a theater where it's military influence will always be rather limited. "Blue water" maritime forces are not well suited to the enclosed waters of the Baltic, threatened as they are by Russian air power and missiles based in their enclave at Kaliningrad. It is fundamentally a continental theatre, where a maritime power such as Britain would find it impossible to contribute significant forces; certainly without compromising it's global limited-war power projection capabilities. As it stands, a power vacuum exists in Eastern Europe. 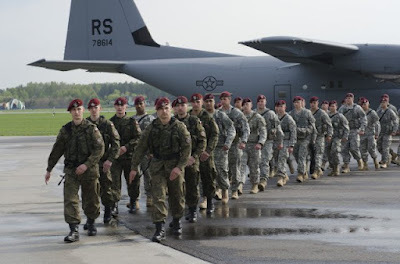 Following the recent withdrawal of the last substantial American ground forces, the two heavy brigade combat teams, from Germany almost all of NATO's first class military capability is now situated to the West of Germany. Although the US has issued an abrupt volte face, returning some of the heavy equipment it withdrew in 2013, Europe is approaching a tipping point. The continuous presence of large American conventional forces can no longer be considered to be a certain prospect.Without enough high-readiness conventional forces positioned nearby, to balance Russia's ability to rapidly mobilise very large numbers of troops (demonstrated time and again by "snap" military drills and maneuvers), the situation will remain unstable and potentially quite dangerous. The return of large-scale US forces to Germany in the long term is something that cannot be counted upon, as a growing confrontation with China in the Pacific continues to exert a powerful draw on overstretched American military resources. Instead, in order to secure the integrity of the NATO alliance (and by extension the Western liberal order in Eastern Europe) Germany must be rehabilitated as a continental great power, integrated into the defence of Eastern Europe. Although the burden of history weighs heavy the most effective means of balancing Russian power in the long-term is to have the other great power in the region, Germany, fully and actively committed to regional security through NATO. The logical question that follows this conclusion is "what does this have to do with the United Kingdom? ", presuming Britain wouldn't be able to exert the influence to instigate such a significant policy change. While it's true that the decision would ultimately rest with the Germans, there is still much the UK could do to help move them in that direction. As one of the most influential members of NATO, with strong transatlantic links to the most influential member, much could be done within the alliance to set the direction and agenda of it's future commitments to Eastern Europe. In recent years Germany has also proved more willing to deploy its armed forces outside its borders, in an alliance context, than in the past. With the right incentives and multilateral direction, their participation in combat and reconstruction operations in Afghanistan could prove to be a watershed moment, the first step along a road leading to a more normal position in the international system. It's not impossible to conceive that this precedent could be used to begin the shift to a regionally deployable Bundeswehr, capable of balancing Russia along with predominantly Eastern European NATO allies. expensive, military forces to it's defence, while its interests elsewhere are pressured. Any attempt to use Germany to balance Russian power must also address the thorny issue of the former's energy dependence on the latter. While it is true that Germany imports some ~40% of its natural gas from the Russian Federation, there are several factors that make the use of the "energy weapon" against Germany a much more unattractive prospect than its use against other Eastern European states. First and foremost is the sheer quantity of Russian natural gas imported by Germany, about a quarter of what Gazprom exports to Europe. Shutting off supply to Germany for a long period of time would likely do serious damage to the Russian state owned energy sector, already struggling in the wake of the collapse in the price of oil. Nor could the energy weapon be used briefly to any great effect either, unlike the Eastern European countries subjected to a punitive gas shutoff in 2009 Germany has substantial storage capacity (equal to ~50% of their annual needs). As Germany is an especially unattractive target, hardened against the Russian "energy weapon", it should not stand as the overwhelming impediment to a more engaged German defence posture in Eastern Europe that it might be considered to be. The reader might, rightly, ask why building a new structure to guarantee the security and stability of Central and Eastern Europe was the first issue addressed when discussing a British grand strategy. In order for the UK to focus it's efforts where it is best equipped to do so, outside the European continent, it needs a measure of freedom from continental commitments. 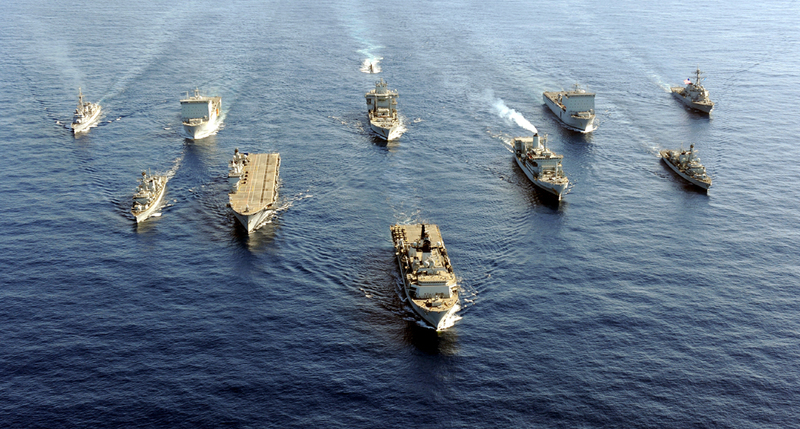 While Britain will always have an important part to play in European defence, through NATO, it needs to be recognised that the UK is best able to contribute on the alliance's "maritime flanks" rather than a distant Eastern "central front". Failing to create new structures within NATO to guarantee the security of Eastern Europe, with Germany playing a key role, will continue to leave that region dangerously exposed to an illiberal Russia. In the long-term the United States will not continue to be the ultimate guarantor of European security forever. They will inevitably continue to be an invaluable ally, and a vital pillar of NATO, but we need to be prepared to take up much of the slack they will leave as their forces are drawn down to a size that allows them to balance their other global commitments. While Britain will always be tied much more closely to the security of Europe by dint of its geographical proximity than the United States, it too must look to balance its commitment to the continent against a much broader demi-global role stretching from the Atlantic to the far reaches of the Indian Ocean. In order for the UK to secure its interests beyond Europe it first needs a measure of stability in Europe. As history shows us, this will require working alongside and supporting continental allies, rather than attempting to replace them. As it stands Britain is a powerful country, with a broad range of advantages and tools at its disposal, constrained by a lack of independent strategic thought, over-reliance on others in the sphere of foreign policy and a volatile European situation. Before a coherent grand strategy can emerge these problems need to be tackled, not by abandoning old alliances and roles but by reinventing and reinvigorating them so that they better suit our current needs and those of our allies. It also needs to recognise that Britain's strengths lie in the maritime sphere, and that this is where we must focus our efforts if we are to successfully defend and advance our interests.